FORMULA ONE: Lewis Hamilton seized an unlikely victory at the German Grand Prix after pole-sitter Sebastian Vettel crashed out in a late-race rain shower. Hamilton started from 14th on the grid after a hydraulics leak knocked him out of qualifying at the end of Q1, but a mixture of tyre management, opportunism and a blisteringly quick car combined to promote him into a position to capitalise on his title rival’s mistake and put him into the drivers championship lead. “It’s obviously very difficult form that position and highly unlikely, but you’ve always got to believe,” Hamilton said after the race. “I would never have thought you could do something like that today. I kept believing and it happened. 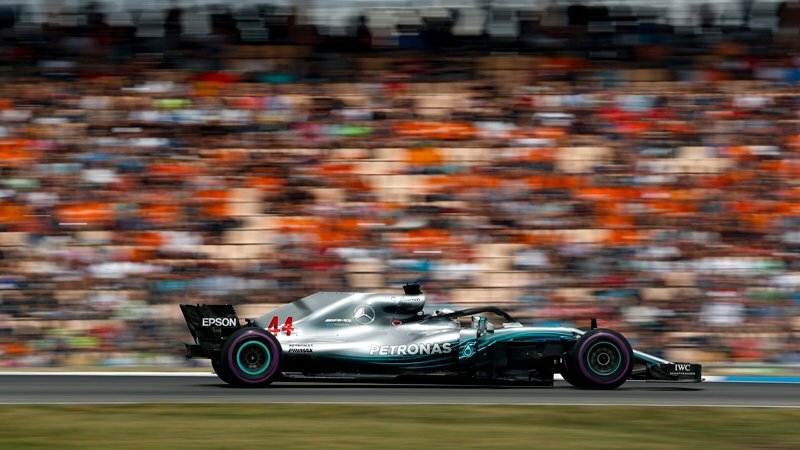 The race started cleanly, but Hamilton was a man on a mission, picking off his rivals lap by lap until he was in fifth place, ahead of the entire midfield, by lap 14. Ahead of him the battle began unfolding on lap 15, when Ferrari called Kimi Raikkonen into the pits from third place to change off him onto the soft tyre. He emerged just ahead of the resurgent Hamilton, preventing the Briton from benefiting from running in clear air. Vettel didn’t follow his teammate into the pits until lap 25, emerging in fourth behind his teammate and new leaders Valtteri Bottas and Max Verstappen. But the weather forecast was colouring race strategy, and both Bottas and Verstappen persisted with their used ultrasofts in the hope rain would arrive and hand them the strategic advantage. Their lap times began degrading rapidly, however, forcing them to stop on laps 28 and 29 respectively. They left Raikkonen in the lead with the faster Vettel behind him, and after some painful negotiating the team swapped the pair on lap 39, with Raikkonen ceding first place to his championship-challenging teammate. The last driver holding out hope for rain was Hamilton, who was up to third ahead of Bottas and Verstappen but on badly degraded soft tyres. The Briton persisted, but by lap 43 his tyres were shot and Mercedes had no choice but to pit him for new ultrasoft tyres. As luck would have it, however, the rain arrived heavily one lap later, but only at turn six, posing drivers the question of whether to switch to wet-weather tyres early and hope for conditions to worsen or to ride out the shower on slicks. Verstappen was the only driver to take the bait, switching to intermediate tyres on lap 47, but the rain eased as he did so, forcing him pit again for slick tyres just two laps later – only for the rain to increase substantially two laps later. Chaos ensued, with drivers tip-toeing over the wet circuit on slick tyres. Most were told by their engineers that it would last only a few minutes and was therefore not worth stopping for, but many almost came to blows on the track, desperately trying to avoid each other around the now treacherous turns. Sebastian Vettel was also struggling with the weather, and though he was crawling around the track, in the tricky stadium section he locked his rear axle, sliding into the barriers and out of the race. Smacking his hands against the steering wheel in frustration, the German tearily apologised to his engineers over team radio before trudging out of his car, his championship lead evaporated. “I don’t think it was a huge mistake,” Vettel told TV reporters. “But it was a huge impact on the race. The German said there were more positives to draw from the weekend than there were negatives. “It was a very positive weekend and was just one of those moments and my mistake. “We have a very strong car, so I think we can be as confident as anybody else. His crash brought out the safety car, behind which Bottas and Raikkonen stopped for fresh ultrasoft tyres, dropping to second and third behind Hamilton but giving themselves a new-tyre advantage over the Briton for the restart, which got underway on lap 58. Bottas aggressively sparred with his leading teammate, the two Mercedes cars racing side by side for a time, but team strategist James Vowles radioed the Finn and told him to hold station rather than challenge for the lead, leaving him to cruise home in second place behind his teammate in a Mercedes one-two formation finish at the marque’s home grand prix. “Conditions were perfect for business time!” Hamilton said. “When it rained I knew that I would have a good position, but you never knew what was going to happen with the safety car. The Briton takes a 16-point championship lead over Vettel into next weekend’s Hungarian Grand Prix, and Mercedes reverses a deficit to Ferrari in the constructors standings to leave Germany with an eight-point advantage. Bottas put on a brave face to deliver the team line after the race, but the Finn emerged from his car clearly disappointed. “As a driver of course the win was what you’re looking for,” he said. “But for Lewis the safety car was better timed. “We had a bit of a battle on lap one after the safety car with Lewis, I didn’t get past, then I was told to minimise the risk, which I understand. Kimi Raikkonen brought home the remaining Ferrari in third. Renault’s Nico Hulkenberg and Haas’s Romain Grosjean picked up fifth and sixth from the carnage ahead of Force India duo Sergio Perez and Esteban Ocon in seventh and eighth. Sauber’s Marcus Ericsson and Toro Rosso’s Brendon Hartley scored the final points of the race in ninth and 10th respectively.